Two Pitt student companies that grew up through the university’s entrepreneurship ecosystem have been included among the nation’s best student startups by the National Council of Entrepreneurial Tech Transfer (NCET2). Aeronics and uTranslated will travel to Washington D.C. April 18-20 to participate in the University Startups Conference and Demo Day, which brings together 40 university startups, entrepreneurs, corporations, venture capitalists, angel investors, policy leaders, and federal government agencies providing a venue to form and maintain robust transaction networks. Last year, Pitt student startup HiberSense was selected to participate in the inaugural student startup day. uTranslated was the inspiration of Nicole Xu, Lujing Gao, then graduate students at the Pitt Graduate School of Public and International Affairs, who had the idea for re-imagining language translation services to empower the translators and deliver reliable cost-effective service for clients. They recruited fellow GSPIA student John Frazier to attend a Startup Blitz weekend startup-athon sponsored by the Innovation Institute. They pitched their idea at the end of the event and won the top prize. 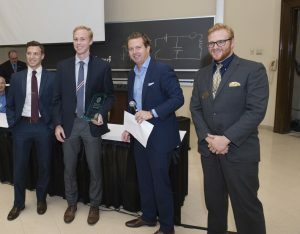 From there they entered the Blast Furnace, a nine week program for students of all levels from across the university to learn the basics of entrepreneurship and were chosen as the grand prize winner in the demo day at the end of the program. Their Blast Furnace success led to their acceptance in the AlphaLab Gear regional business accelerator in Pittsburgh’s East Liberty neighborhood. “It’s a tremendous honor receive this recognition as we work tirelessly to make uTranslated an international success. I think it speaks loudly that two companies will be representing the University of Pittsburgh. It’s a credit to the Blast Furnace program that the Innovation Institute has built,” said John Frazier, CEO of uTranslated. Aeronics captured the top prize in the Wells Student Healthcare Competition. From left, Mark Spitz, Blake Dube, Michael G. Wells, and Alec Kaija. The Aeronics team of Swanson School of Engineering PhD candidate Alec Kaija and undergraduate friends Blake Dube (Swanson) and Mark Spitz (School of Education) used Blast Furnace as a capstone to their entrepreneurial journey through Pitt Innovation Institute programming. Previous to entering Blast Furnace, the trio had taken advantage of the education and mentoring offered through the Innovation Institute’s Pitt Ventures Gear Program and had won the $25,000 top prize in the 2016 Randall Family Big Idea Competition and won prizes in both the Michael G. Wells Student Healthcare Competition and Kuzneski Innovation Cup. (Applications are currently being accepted for both competitions through May 15, 2017). They also won a $25,000 prize in last years Pitt Innovation Challenge (PInCh), that awards $450,000 in prizes for prosing early stage health care innovations. Aeronics is developing portable oxygen devices to assist people suffering from chronic obstructive pulmonary disorder (COPD). “Being selected by NCET2 for this event is exciting for our company, because it gives us the opportunity to extend our network and continue to spread our idea. Having two Pittsburgh companies being awarded with this honor is indicative of the growing entrepreneurial community in Pittsburgh, which is something I have noticed and benefited from even in the last three years,” said Dube, CEO of Aeronics. Coticchia is currently directing the fifth cohort of the Blast Furnace, comprised of nearly 30 teams, the largest group to go through the program since its inception in 2015. New this year, five teams have been selected as Blast Furnace Fellows, each receiving $10,000 to work full-time on their idea with the goal of launching a startup by the end of June. “We are proud of the fact that Pitt students launched a record 12 startups last year, Coticchia said. “Learning the elements of entrepreneurship is beneficial to students whether they decide to start a company, or if they lead innovation projects within a larger organization,” Coticchia said.